Lindos, Lindos or (Λίνδος), is the second most visited city of the island of Rhodes after Rhodes Town itself. Lindos is situated on the east coast of Rhodes , 55 km south of the capital , after the picturesque villages and traditional of Afandou , Archangelos , Malona and Massari. 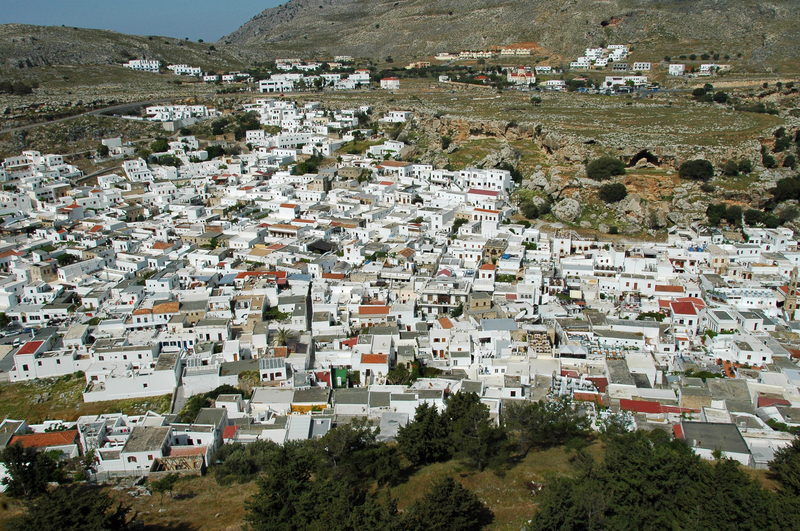 The old town shows whitewashed houses clinging to the sides of a small hill amphitheater. 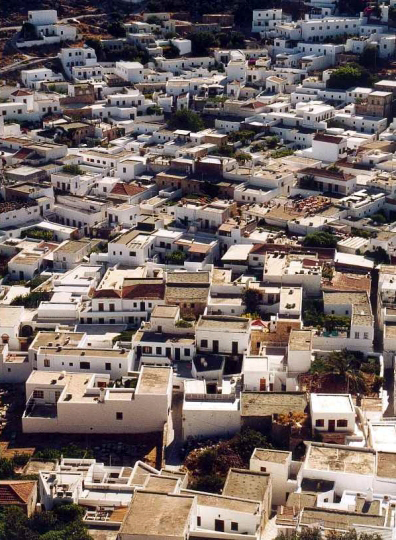 With its narrow streets, its houses of captains and their hidden gardens, the Old Town enchants all visitors. 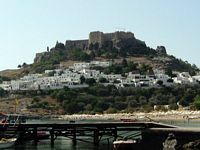 The citadel, seen from afar, overlooking the village and contains a acropolis dating from 1100 BC. J. C, a Byzantine chapel, and fortifications erected by the Knights of St. John . 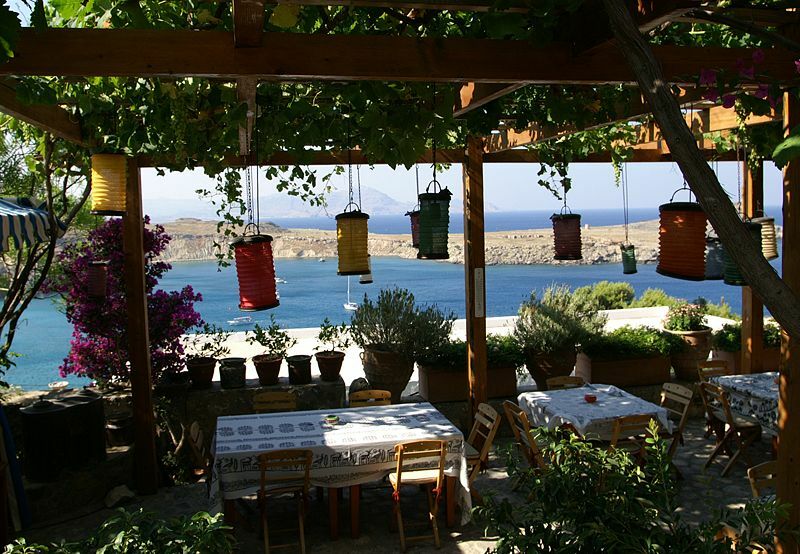 The two civilizations, Greek and medieval rub shoulders harmoniously. 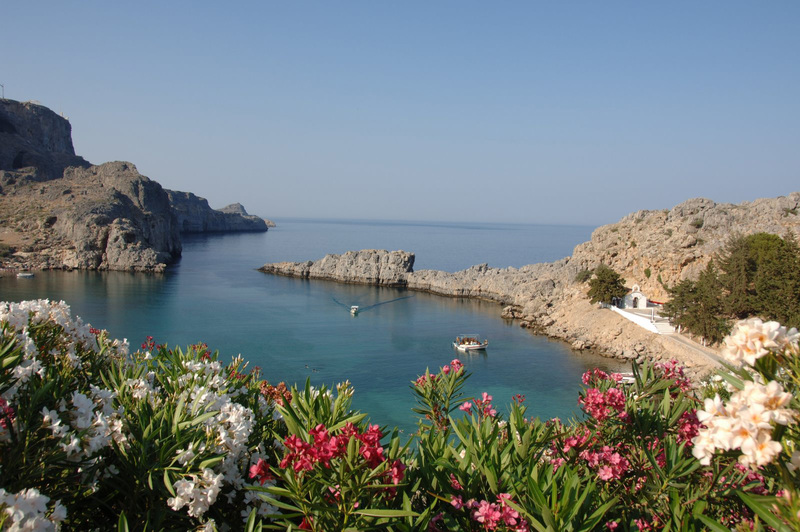 When the tourist season in full swing, Lindos has a very active nightlife, bars with music, restaurants, et cetera. 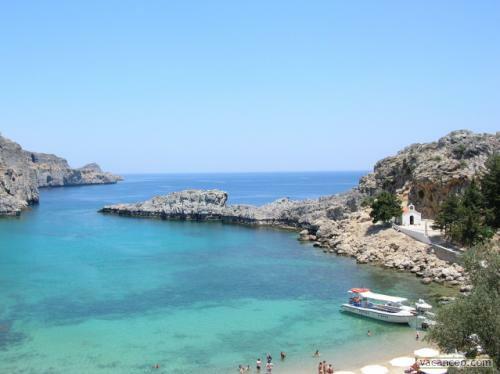 But Lindos is also a small fishing village where you can enjoy good fresh fish. 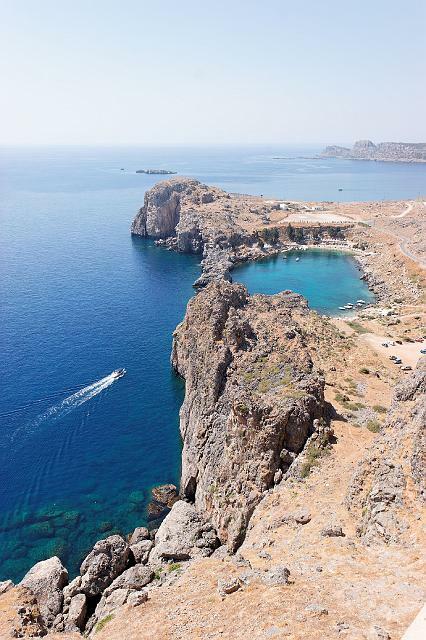 The acropolis of Lindos overlooking the Bay of Saint-Paul, a small enclave in the turquoise blue water, surrounded by rocks, bay owes its name to the apostle Paul who stayed here in 57 AD - C. during his journey to Ephesus . 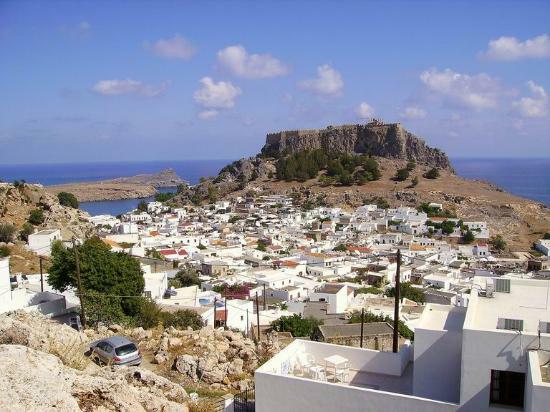 The port of Lindos was prosperous from the Mycenaean to - 1600 BC. Ten centuries later, the Achaeans settled, but it was not until the tenth century BC (Geometric period) and the arrival of the Dorians for Lindos rivals and exceeds the cities of Kamiros and Ialyssos . 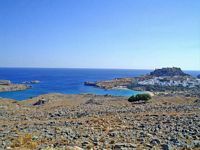 Lindos was built by the Dorians in the tenth century BC and housed two temples dedicated to Athena Lindia well as Heracles. When the fate of Hellas "Obscure Centuries" (1050 - 900), the Dorians settled in Camiros, Ialyssos and Lindos, which form the hexapole ("the six-cities") with the Dorian island of Kos, and the cities of Asia Minor Cnidus and Halicarnassus. 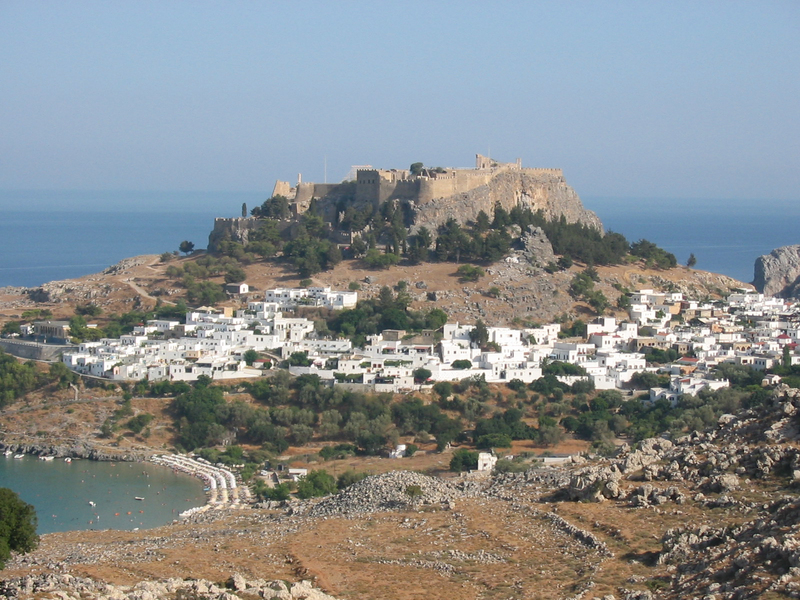 In the seventh century BC, Lindos is a naval power. Its inhabitants trade with Cyprus and Egypt. During the first Medical consultation War (490 BC), the Persians, commanded by Datis, admiral of the fleet of Darius I, besieged Lindos, which had fled much of the population of Rhodes. Soon, the water ran out of the besieged, who began to consider surrender. At this time, Athena appeared in a dream to one of the magistrates of the city, encouraging them to stand firm, because it intercede with Zeus to provide water to Lindiens. He informed his fellow citizens, who, having assessed their water and having an estimated five days, the Persians demanded a truce: if using Athena had requested his father could not at that time, they would go to Datis. One laughed when he heard the request. However, the next day, a huge rain cloud formed above the acropolis, pouring torrential rain on the besieged, restoring their reserves, while the Persian troops were suffering from thirst. 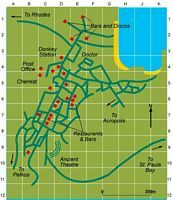 Impressed by this feat, Datis offered the sanctuary of Athena Lindia her coat, her necklace, her bracelets, her tiara, his sword and his chariot before making peace with the Lindiens, arguing that "these men were gods protected ". 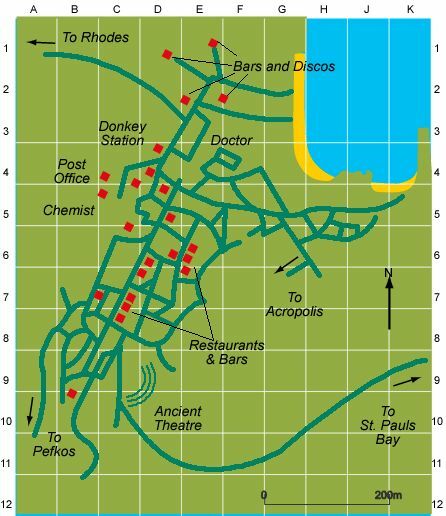 In 408 BC, the inhabitants of Lindos heard with those cities of Ialyssos and Camiros to found a new city on the northernmost tip of the island, they named Rhodes, and which soon eclipse them. 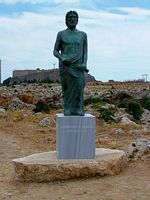 The great age of Lindos is the sixth before Christ, when it is led by the tyrant Cléobule (Kléoboulos) (-560 to -630 worm BC), a native of the city and the one of the Seven Sages of Greece. 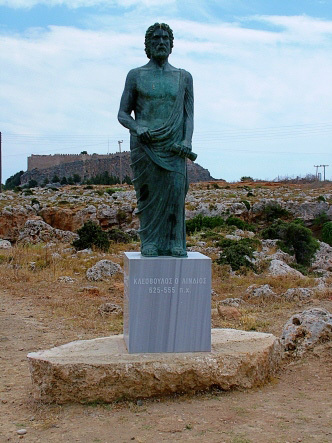 Cleobulus, known as one of the seven sages of Greece, very democratically ruled his city for 40 years, he was known to speak very often in riddles. A new temple to Athena Lindia was built during his reign at the site of an older sanctuary. The bullies were essentially individuals who, having taken power sometimes by force, allied themselves with the middle and lower layers of their cities against the landed aristocracy: colonial expansion and major construction policy ensured the future of a large part of the population. The Seven Sages meant a group of seven ancient philosophers, legislators and politicians, renowned for their wisdom. They are found at Delphi Apollo to offer their currencies. Found among the seven sages Thales of Miletus (whose motto was "Do you never wear Guarantor"), or Chilo of Sparta (whose motto "Know thyself" was fame). 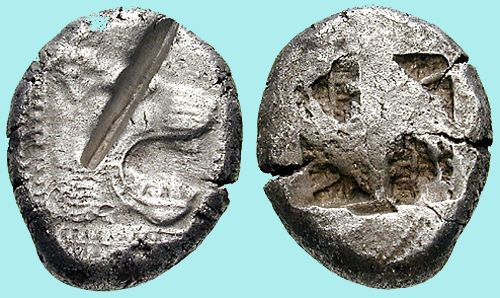 Currency offered by Cléobule Apollo was "moderation is the greater good." 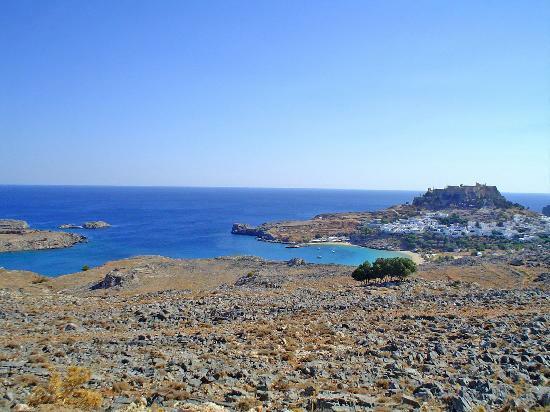 Lindos is also the birthplace of Chares of Lindos, the architect who built the " Colossus of Rhodes ". During World War II, a commando is responsible for a dangerous mission: destroy huge German guns located on the island of Khéros. 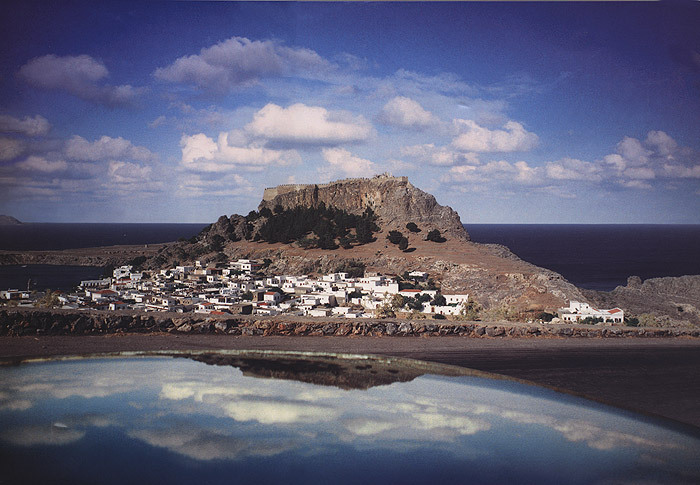 The film has actually been shot in Lindos, the Lindos top of the rock, you can see huge cliffs where the film was shot. 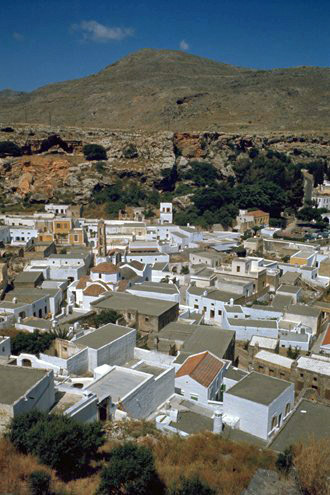 Lindos is a listed historical monument long as: cars are banned in its narrow streets, only donkeys and small motorcycles can move the joint.